​​​​​​McALLEN - The market vacancy rate fell by 47 basis points (bps) quarter-over-quarter and 341 bps year-over-year, according to CBRE’s 3Q 2016 McAllen Industrial Marketview. A reported 71.0 percent of gross absorption in 3Q 2016 was channeled through Class A product. By the end of 3Q 2016, year-to-date net absorption was more than 1,​3​​​​00,000 sf. The 532,214 sf of net absorption in 3Q 2016 continued the 12th quarter positive streak in net demand and offset the largest wave of vacancies during this market cycle. This robust activity pushed vacancy down further to a new cycle-low reaching 6.1 percent. 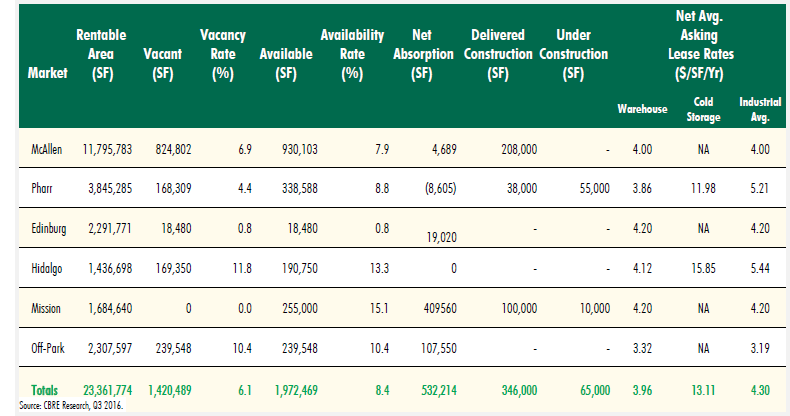 ​Click to find rates and trends in CBRE's 3Q 2016 McAllen Industrial Marketview (PDF).